Does Quintana Roo share a border with Guatemala? Not any longer. Maps, Updates to Geo-Mexico Comments Off on Does Quintana Roo share a border with Guatemala? Not any longer. The state of Quintana Roo is Mexico’s youngest state (together with Baja California Sur), though this is set to change when Mexico City is formally declared a state, probably later this year. Quintana Roo, established in 1974, is well known to tourists because its largest city is the tourist mega-resort of Cancún, on Mexico’s Caribbean coast. The northern part of Quintana Roo has a shoreline along the Gulf of Mexico. To the west of Quintana Roo lie the states of Yucatán and Campeche. But what about the southern limit of the state? Does it, or does it not, share a border with Guatemala? In the early 1990s, the answer to this question was certainly “yes”, but things have changed since then, and the correct answer today is “not any longer”. The state officially claims an area of 44,705 square kilometers (17,261 sq mi), but since 1996-97 there has been a boundary dispute with the states of Yucatán and Campeche over an area of approximately 10,200 square kilometers (3,900 sq mi). 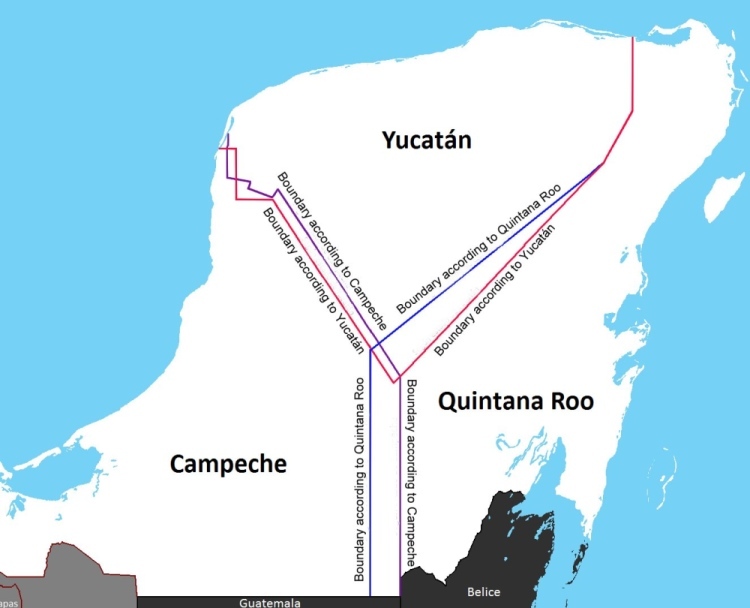 The contentious boundary issue arose when Campeche delimited a new municipality, Calakmul, in the south-east part of the state, and in doing so “annexed” a piece of Quintana Roo. This shifted the boundary between the two states towards the east, with a knock-on effect that the state of Yucatán also lost a small amount of territory to Campeche. However, Yucatán State simultaneously gained ground from Quintana Roo (see map). Confused? Well, that is really only the beginning, since the states of Yucatán and Campeche also dispute their shared boundary further north. Confused administrative boundaries are never an easy thing to fix, and land boundary disputes are rife in Mexico at every level, so getting municipal, state and federal authorities to agree on a resolution takes time. The major Campeche-Quintana Roo dispute arose in the late 1990s, but was only finally settled, somewhat arbitrarily by federal court, in 2013. The court sided with Campeche, and Quintana Roo lost its border with Guatemala. Oh dear… our Geo-Mexico map of Quintana Roo is now out of date! Leaders in the northern Mexican states of Coahuila, Nuevo León and Tamaulipas met in Laredo on 17 January 1840 and declared independence as the Republic of the Río Grande. They hoped to gain independence from the central Mexican government as Texas had done in 1836. Unfortunately for the infant republic, the state legislatures in the three states did not support their rebellion. The new government of the Republic of the Río Grande moved often to avoid being captured by the Mexican federal troops. They started in Laredo, the republic’s initial capital, but in the first few weeks moved to Guerrero, Tamaulipas. Next they moved to Victoria in the new Republic of Texas, where it remained. The insurgent forces, under General Canales were composed of state militias from the three states and volunteers from the Republic of Texas, which was sympathetic to the cause of the Republic of the Río Grande, but unwilling to jeopardize their new independence by officially recognizing and providing troops to the Republic of the Río Grande. The insurgents and federal forces battled several times during the middle of 1840. When the federal forces won the March 24–25 Battle of Morales (Coahuila), the surviving insurgents, under General Canales, retreated to San Antonio, Texas. In June, a group of insurgents under Colonel Jordan captured Ciudad Victoria, the capital of Tamaulipas, and had ideas of marching on San Luis Potosí. Instead they marched to Saltillo and in October attacked the federal forces there. From there they retreated back into Texas. After that battle, it became clear that the insurgent forces could not sustain the rebellion. On November 6, 1840 the Republic of the Río Grande ended when General Canales agreed to end the rebellion in exchange for a brigadier general position in the federal army. The short-lived republic lasted a total 294 days. Additional information is available at the Republic of the Rio Grande Museum in Laredo (photo). The evolution of Mexico’s political boundaries is discussed in chapter 12 of Geo-Mexico: the geography and dynamics of modern Mexico.